Everyone loves pizza. And, everyone loves cookies. Why not combine the two? This is my recipe for a popular potluck dessert or a special treat for the office. You can use any type of cookie recipe and toppings that you like – just like you make your favorite Italian pizzas with sausage, pepperoni or just cheese. To make it even easier (if you really aren’t that adept at baking), just buy the tubes of cookie dough and flatten into a pizza shape. 1 package of sugar cookie dough mix or your own recipe for sugar cookies (You can even use chocolate chip or peanut butter cookie dough, if you’d prefer). 1 package of frosting (your favorite flavor) or flavored cream cheese (strawberry is my personal fave). A variety of fresh fruit (strawberries, blueberries, kiwi – whatever you like). A variety of candies (M&Ms, Reese’s Pieces, jimmies, etc.). Mix the pre-packaged cookie dough as directed. Instead of making individual cookies, roll the dough out into a large circle on a pizza stone. If you don’t have a pizza stone, you could also use a large baking sheet. Follow the baking instructions as a guide, you will probably need to add a few extra minutes on to bake this massive cookie thoroughly. When the cookie is done baking, cool completely on the pizza stone or baking sheet. After the cookie has cooled, cover in frosting or cream cheese. Decorate with fruit, candy or other toppings. To serve, you can cut into slices (like a pizza) or into smaller portions. 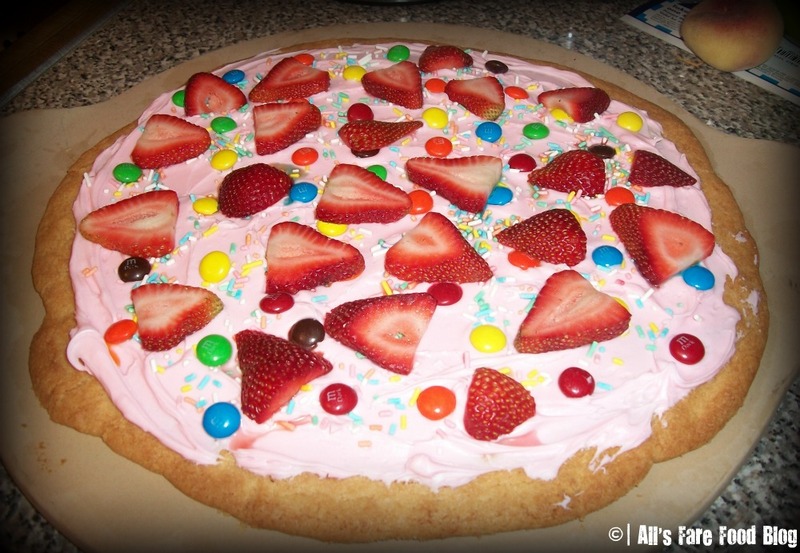 This entry was posted in Cuisine - Desserts, Recipes and tagged candy, cookie, cream cheese, dessert, frosting, fruit, pizza, potluck, recipe by Christina. Bookmark the permalink.